I hope you are all having an amazing Labor Day. For today's Makeover Monday we will be going over the final concept design for my office. This is for the wall to the right of the last design post. I have always wanted to have a couch in my office. It's perfect for when I need to take a break from sitting or have company over. Velvet has made a big comeback and I love the look of a navy velvet couch. I thought my office would be the perfect place to add this statement piece. To the left of the couch we have a gold lamp to add some light. Above the couch I wanted something to fill in the space so it wouldn't feel so open. I looked and looked but couldn't find any artwork that I felt fit the theme of the room. I found these printables and thought that they would be perfect to take up the space above the couch. I love that the font keeps it classy but the phrase "good vibes" feels more like my personality. 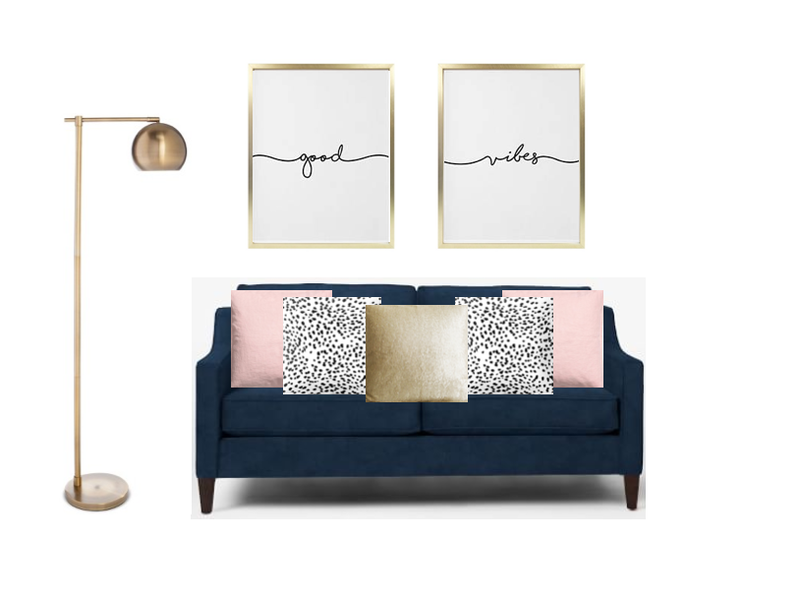 To add in some color I added blush pink, black and white spotted and gold throw pillows on top of the couch. The office feels classy and playful. It's the perfect balance to get my creative juices flowing. What do you think about the velvet comeback? Love it? or hate it?